An eclipse of the moon occured overnight, but despite some hoopla on the Internet, it was not visible to backyard skywatchers. The moon shines by reflecting sunlight. The eclipse occured as Earth cast a partial shadow on the moon. 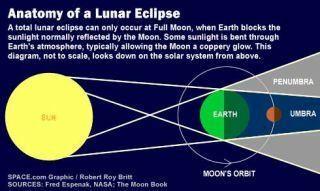 The event is called a penumbral eclipse, and the setup involves only the outer shadow of Earth, rather than the full shadow, or umbra, that can cause a total lunar eclipse or a partial lunar eclipse (the latter looks like a bite has been taken out of the moon). The eclipse "will not be visible to the naked eye," NASA stated prior to the event. The imperceptible dimming took place over the Americas, Europe, Africa, and parts of Asia. The next visible lunar eclipse, a partial one, will occur Dec. 31 and favors skywatchers in Europe, Africa and Asia.